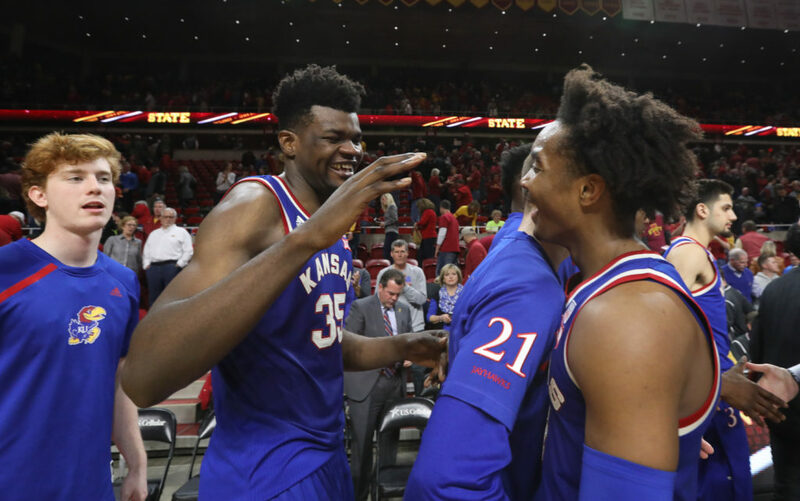 Kansas center Udoka Azubuike (35) smiles as he meets Kansas guard Devonte' Graham (4) in the handshake line following the Jayhawks' 83-77 win over Iowa State, Tuesday, Feb. 13, 2018 at Hilton Coliseum in Ames, Iowa. Graham went two of five from the free throw line in the final minutes. AMES, IOWA — Iowa State’s Solomon Young went up for a short baseline jumper, and Kansas center Udoka Azubuike went up with him and made contact. The whistle blew, and 21 seconds into the second half, Azubuike picked up his third foul. He stole a glance toward the bench, figuring he would see Mitch Lightfoot being summoned to replace him. Lightfoot remained seated. 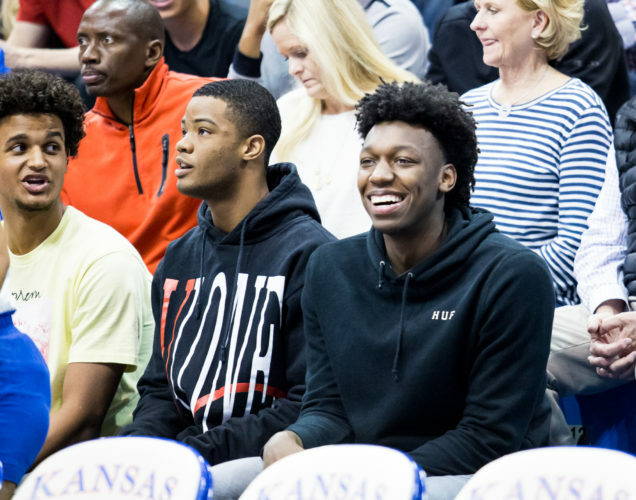 He went to town is what Azubuike did, scoring 12 of his team-high 19 points in the second half to lead Kansas past Iowa State, 83-77, Tuesday night in front of 14,384 spectators in Hilton Coliseum. 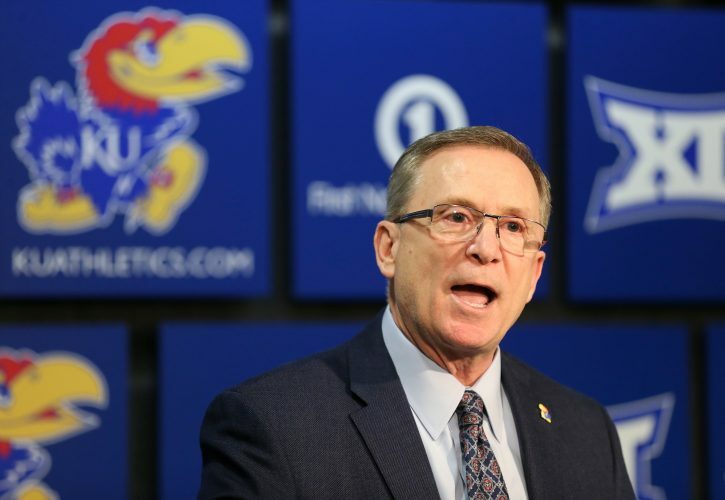 (Kansas won the first game vs. ISU, by a nearly identical score, 83-78, in Allen Fieldhouse). Azubuike’s three rebounds and three blocked shots all came in the second half, when he played 15 of his 22 minutes. Most college basketball coaches almost automatically bring a key player to the bench if he picks up his second foul in the first half, and do the same when he gets whistled for his third early in the second half. Self wasn’t in the mood to see anything less than his best lineup on the floor, so he gambled on his ever-improving big man. Azubuike was eager to reward his coach’s trust in him and knew he had to pull off a challenging juggling act to do so. He needed to play aggressively without picking up a quick fourth foul. Azubuike pulled it off, fighting hard to establish position close to the hoop at the offensive end. 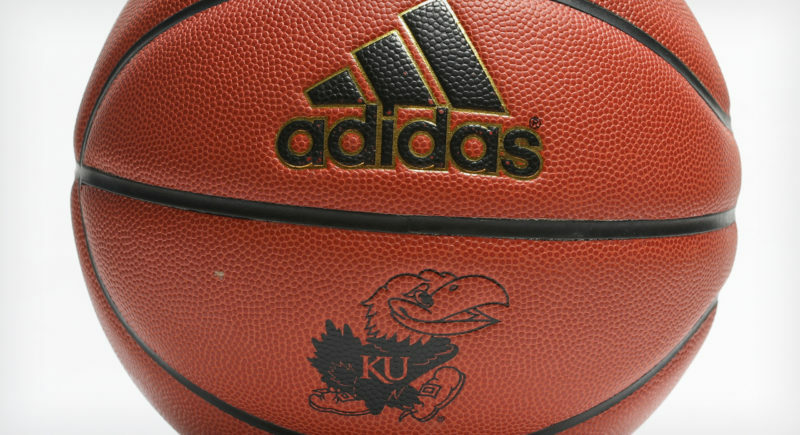 Lagerald Vick and Azubuike combined to score KU’s first 15 points of the second half, Vick’s coming on a trio of 3-pointers and Azubuike’s as a result of sure hands, sound footwork and a soft touch close to the basket on a variety of shots. He scored on three consecutive possessions, each time growing KU’s lead from single to double digits. Azubuike didn’t pick up his fourth foul until 1:58 remained in the game and Kansas led by nine. The lead had grown to 13 points with 4:46 after Azubuike asserted himself at both ends with back-to-back dunks and a couple of blocked shots. KU’s guards repeatedly looked for the big man late in the game with lobs that he flushed easily. Self would like to see his players take advantage of Azubuike more with alley-oops because he is so reliable at converting them. 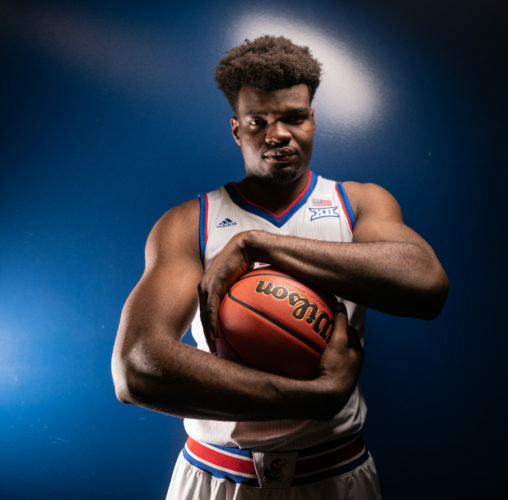 Azubuike has developed into an offensive force. When all four shooters surrounding him are in a groove, it makes it tougher to double him. It becomes easier when freshman Marcus Garrett — a strong defender, but not a shooter — is in the lineup. 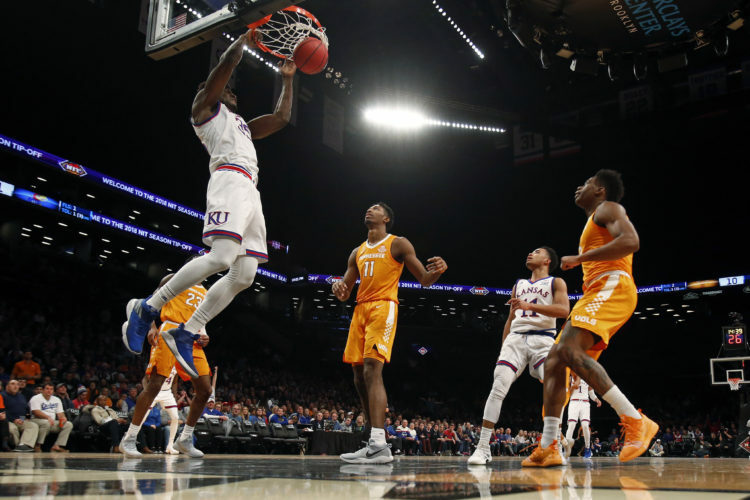 “That’s a big release off the four guards who are on the court with him, knowing whenever we need a big basket, we can go in to the big fella,” sophomore guard Malik Newman said. The guards can return the favor to their center by not putting him in jeopardy of picking up fouls. Self gambled a little in trusting that his only bona fide center could continue becoming a force without drawing whistles, and it paid off in a big way. Smart play by the coach whose team remained one game behind first-place Texas Tech in the Big 12 standings with five games remaining.